It is the policy of Mpumalanga Rubber, that all aspects of its operations be conducted in a safe manner. We recognize that safeguarding the health and welfare of our employees is of the highest priority. Each employee must follow strict safety procedures set in place on all sandblasting and painting sites. Our guidelines are set in place in accordance to Department of Labour regulations as well as OSHA’s standards in safety. Our goal is to maintain an accident free work environment Managements and employee’s are constantly aware of any and all potentially hazardous conditions. Our policies require prompt reporting of all conditions on the work site. All staff are required to attend all safety meetings and have knowledge in hazardous materials. Sandblasting equipment is used extensively throughout the world, for the purposes of cleaning and preparing various surfaces. Sandblasters can be exposed to toxic materials, such as lead, zinc, silica… while sandblasting surfaces. Sandblasters may also be exposed to these hazards from the sandblasting agent, usually silica sand, (Mpumalanga Rubber does not use silica sand) therefore there are a number of safety precautions that must be undertaken by blast operators and other crew members. • Sandblasters who are exposed to dusts must where adequate ventilation equipment. All dust is a concern! • Sandblasters must only remove their supplied air breathing equipment when they are well away from the work location as silica dust and other contaminants can remain suspended in the air for long periods of time. • All sandblast pots must have a safety shut down, pressure gauge and pressure relief valve. The management of Mpumalanga Rubber, striving for excellence in all we do, recognises the impact that our activities may have on people and the environment. We will implement and maintain, as far as, reasonably practical, the activities of the company in such a manner as to prevent harm or damage to persons and property respectfully. Safety, health and the protection of the environment will form an integral part of our planning and decision making. We will manage our company, wherever we do business, in an ethical way that strikes an appropriate and well reasoned balance between economic, social and environmental needs. • Conducting our business with respect and care for people and the environment. • Responsible utilisation of natural resources. • Continually improving our safety, health and environmental performance. • Complying, as a minimum, with all applicable legal and other agreed requirements. • Promoting dialogue with stakeholders about safety, health and environmental performance. 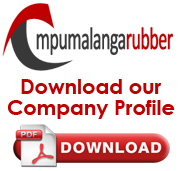 • Implementing safety, health and environmental management systems. • Informing and appropriately training all employees and contractors on safety, health and environmental matters. • Responding effectively to safety, health and environmental emergencies involving our activities and products. • As far as reasonably practicable, providing appropriate resources to implement the above. • Ensure that the health, safety and environmental policy is reviewed at periods not exceeding three years from the effective date or by a date set by the Managing Member. 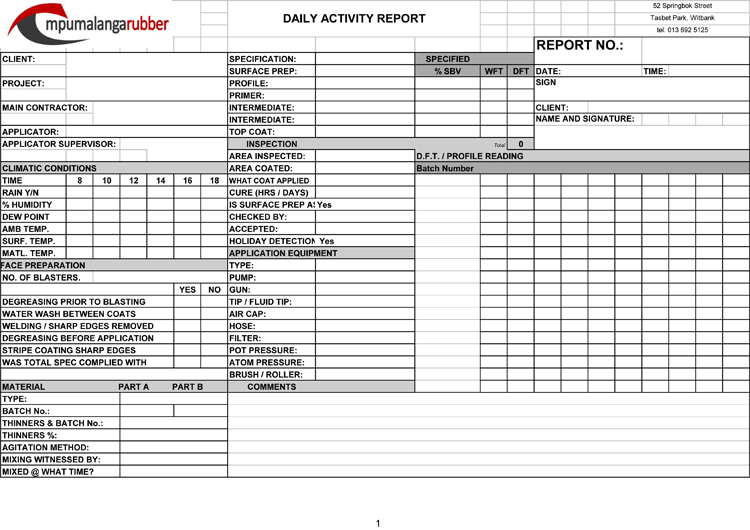 Mpumalanga Rubber supplies clients with a Daily Activity Report, enabling clients to track a job’s progress.